Clear Lake, near Fremont, Indiana, is a special place for both Mike Franz and Jim Balmer. Both men spent part of their childhood at the lake, although they never met as kids. Had Mike and his wife Pat not decided to build a summer cottage on the lake, they might never have known each other. Almost 40 years later, the two returned to Clear Lake to create a timber frame home where the Franzes could build memories for their children and grandchildren. 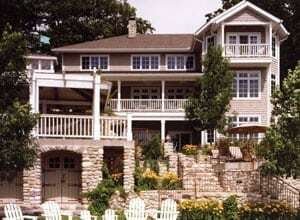 For several summers, Mike and Pat Franz rented a cottage at Clear Lake. One day as they were biking, they found a lot with an older A frame for sale by owner. The triangle shaped lot measured about an acre, and featured about 100 feet of lake front, with a sandy beach perfect for swimming. The existing home on the property was in serious disrepair and not worth salvaging. After meeting their new neighbors to be, and touring their timber frame home, Mike and Pat decided a timber frame was the perfect style for a summer cottage at Clear Lake. The neighbors introduced Mike and Pat to Bill Schuemann and his son, Bill, Jr., co-owners of S&S Construction and Timber Framing, who had been general contractors for several timber frame homes in the area. 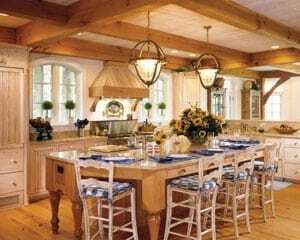 The Schuemanns, in turn, referred the owners to Riverbend Timber Framing in Blissfield, Michigan, who had created the frame for the neighbors home. At Riverbend, the Franzes finally met Jim Balmer, a project coordinator, who was eager to work on the Franz home. In addition to being able to visit Clear Lake and remember what it was like when he was a child watching his uncle build boats at the boathouse, Jim found the Franzes to be great customers of whom to work with. “Mike is very much a hands-on person. Perhaps this comes from his education and practice as a physician. He also enjoys woodworking, and, in an effort to really capture what the cottage would be like, Mike constructed a detailed model of the home. Although our original design showed a gable roof, Mike felt a hip roof would suit the lakefront property better. He was right.” Jim says. Because the 3,500 square foot cottage was to be a place the Franzes could vacation with their children and grandchildren, Mike and Pat planned the design to accommodate both family gatherings and individual privacy. The open great room in the rectangular portion of the home includes the living room and the kitchen where they could spend time with their two daughters and their families, and their son. A powder room and a laundry room also can be found here. The octagonal area of the main level contains the dining room while the second level of this portion houses the couples private master bedroom and bath. “On the main level, two guest bedrooms are joined with a bath. This allows the parents to sleep in one room with their children in the adjacent bedroom. We duplicated this arrangement in the second story. It gives each family a private mini suite,” Pat explains. The walkout level adds additional square footage to the home with a recreation game room, home theatre, combination gas and wood burning fireplace, and wet bar. Furnished with hide-away bed sofas, the rec room is ideal for the Franzes son and his friends. A full bath is conveniently located for the family to shower when they come in from the lake. Mike also claimed space on this level for his woodworking shop. Mike and Pat’s involvement in their new cottage didn’t stop with the design phase. They spent two full weeks on the site so they could be present when the timber frame was raised. “Once the frame is up, we set a Christmas tree on top to give thanks. I am pleased Mike and Pat could be there for the event.” Bill says. “We wanted to be part of the project to feel like it was truly our cottage,” Mike says. “We helped with staining the interior wood, especially the ceiling boards. We just kept experimenting until we got the look we wanted. We took sample boards which we then painted and rubbed off the paint to get just the right antique appearance.” Pat adds that Mike did all the finish work on the cabinets and made the gazebo doors in his workshop. With three children and five grandchildren as frequent visitors, the Franzes designed their kitchen so everyone could join in the culinary efforts. Pat reports Mike’s favorite contribution is grilling on the professional Thermadore range. One of the two Sub-Zero side by side refrigerator-freezers is devoted to drinks and water to prevent the main food storage unit from being opened frequently during the warm summer months. Pat enlisted Heather McCormick Interiors in Columbus, Ohio, to assist in her decorating the cottage. 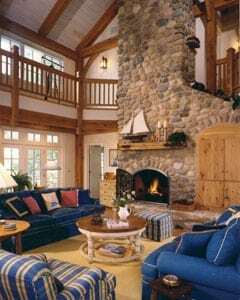 Heather recommended several pieces of furniture, including the sofa and chairs in the great room, as well as the light fixtures. 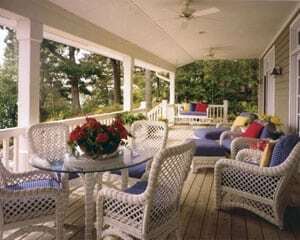 Pat planned for the cottage to be light and airy, selecting fabrics and furnishings in blue, yellow and white with red accents. The upholstery is washable so no one feels like they can’t relax. She adds lots of stuffed animals for the grandchildren to play with. Although several trees had to be removed during construction of the home, the owners replanted ash trees for shade between the house and the lake. Mike took charge of the landscaping and added low maintenance perennials such as hydrangeas and day lilies. Fortunately, all of the Franz adult children live less than three hours driving distance of their parents cottage. With Mike, Pat, and their older daughter and her family in Columbus, Ohio, their younger daughter and her family in Chicago, and their son in Toledo, Ohio, family get – togethers can occur frequently. At the present time, Mike and Pat have no plans to relocate to the lake permanently, but with Mike semi – retired, they are able to spend long weekends throughout the year and several weeks in the summer. Summers have come and gone at the Franz cottage and each one was a delightful experience for the family. Jim Balmer has since moved on to new projects, but will never forget meeting Mike and Pat and the cottage they all created together for another generation to someday look back and remember their childhood summers at Clear Lake. To view the complete photo gallery of this custom timber frame home click here, Clear Lake, Indiana Residnece.